Silver Spring, MD --Teeming with the same hard-bitten sensibility and emotional resonance that made Prime Suspect a television landmark, Trial & Retribution: Complete Collection arrives on DVD in a value-priced collector's edition from Acorn on August 13, 2013. Created and written by BAFTA winner and Emmy(R) nominee Lynda La Plante--"the playwright laureate of women crime-stoppers" (NPR's Weekend Edition)--the 22-feature-length mysteries of the long-running British series follow each case from the scene of the crime to the courtroom verdict. Boasting innovative storytelling and uncompromising realism, Trial & Retribution powerfully portrays the psychological scars that violence leaves behind. The DVD 18-disc set includes 22 mysteries (Sets 1-6), plus bonus behind-the-scenes documentary with cast and crew interviews (46 min. ), interviews with Lynda La Plante, David Hayman, Victoria Smurfit, and Colin Salmon (41 min. ), and much more ($149.99, AcornOnline.com). 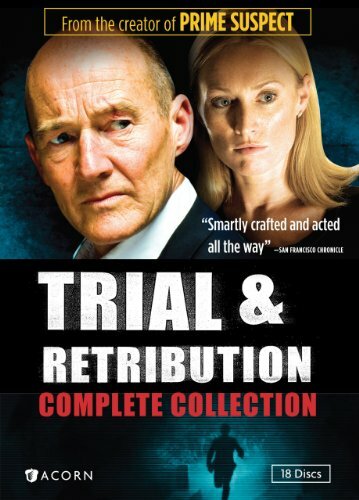 Akin to Law & Order, Trial & Retribution takes viewers from the crime scene to the forensics laboratory and from police headquarters to the courtroom. David Hayman (Sid and Nancy) stars as DCS Mike Walker, with Kate Buffery (Wish Me Luck) and Victoria Smurfit (About a Boy) as his partners. Guest stars include Hugh Dancy (Black Hawk Down), Iain Glen (Downton Abbey), Simon Callow (Amadeus), Greg Wise (Sense & Sensibility), Gemma Jones (Bridget Jones's Diary), Corin Redgrave (The Forsyte Saga), Charles Dance (Gosford Park), Rosamund Pike (Pride & Prejudice), and Michael Fassbender (Inglorious Basterds, X-Men). The series premiered on ITV in the U.K. in 1997, and aired for twenty-two mysteries, ending in 2009. Acorn has also released several other series from Lynda La Plante including Prime Suspect, Above Suspicion, and The Commander. An RLJ Entertainment, Inc. brand (NASDAQ: RLJE), Athena releases provide an authoritative and entertaining learning experience through high quality, informative, non-fiction programming. Athena's 2013 releases include: She-Wolves: England's Early Queens, Missions That Changed the War: The Doolittle Raid, Shakespeare: The King's Man, The Story of Math Collection, Broadway Musicals: A Jewish Legacy, and Understanding Art: Hidden Lives of Masterpieces. Athena DVD sets are available from select retailers, catalog companies, and direct from RLJ Entertainment at (888) 870-8047 or AcornOnline.com.